The potential for reducing energy costs on islands and moving towards energy autonomy has never been greater: this was the comprehensive consensus that transpired from the second Clean Energy for EU Islands forum on 5 November in Lanzarote, Spain. The opening session was co-chaired by the Regional Minister of the Economy, Industry, Trade and Knowledge of the Canary islands Government, Mr Pedro Ortega Rodriguez, and the Commission's Director-General for Energy, Mr Dominique Ristori. Focusing on the opportunities for islands in the context of the clean energy transition, the session included speeches by the President of the Canary Islands Mr Fernando Clavijo Battle, the Minister for Energy and Water management of Malta Mr Joe Mizzi, Members of the European Parliament Mrs Inés Ayala Sender, Mrs Maria Spyraki, and Mr Tonino Picula, as well as the President of the Cabildo de Lanzarote Mr Pedro San Ginés. The forum gathered a wide-ranging audience representing EU islands and outermost regions, island associations, EU institutions, national and local administrations, businesses and energy industry, academia and civil society. The forum's agenda focused on finding ways to accelerate the clean energy transition in islands by making them frontrunners in the transformation of their energy systems. This shift must ensure secure and competitive energy is delivered whilst also bringing benefits to local economies and deploying innovative clean energy technologies. The forum discussed achievements since the launch of the Initiative one year ago, the experience of clean energy transition of outermost regions, progress on technologies supporting the clean energy transition, the recently launched Secretariat supporting the Initiative, as well as the importance of stakeholders’ engagement in the clean energy transition. To support the EU’s clean energy transition and the commitments under the Paris Agreement, the EU's more than 2000 islands need to combine a reduction in their dependence on fossil fuel imports with sustainable development and job creation. Technical meetings will follow early next year. The first forum was about setting the ambition for EU islands in the context of clean energy transition. The second forum confirmed the rise of islands on the clean energy transition front. The potential of already available clean energy technologies to enable EU islands to become leaders of the energy transition, reduce energy costs and move towards energy autonomy has never been greater. The forum takes place as part of the Commission's Clean Energy for EU Islands initiative launched in Malta in May 2017. 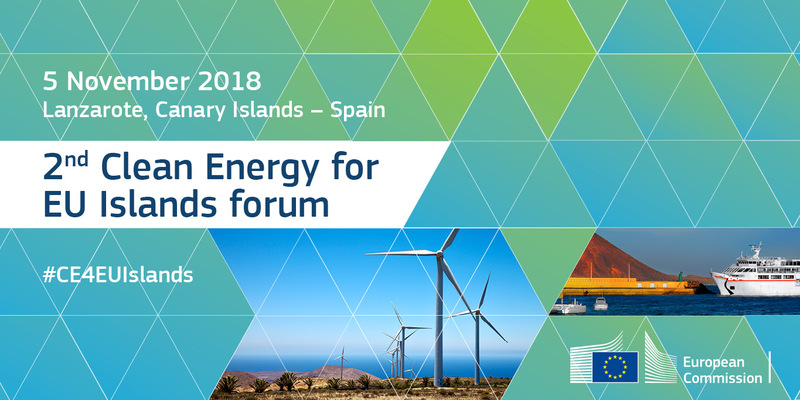 It is organised by the European Commission with the support of the newly established Secretariat for the Clean Energy for EU Islands Initiative and co-hosted by the Government of the Canary Islands. The first Forum, officially launching the Initiative, took place in Chania, Greece, in September 2017.